ElectrIQ Power is a Palo Alto, California-based energy storage company that designs and engineers its systems in the United States. ElectrIQ’s flagship product is the IQ System, which includes a battery, hybrid battery/solar inverter, home energy management system, and an energy meter. The IQ System offers backup power as well as smart home energy software to manage your home’s electricity use and optimize energy efficiency. But how does ElectrIQ’s IQ System measure up against other home energy storage options? Read on to learn more about the IQ System’s technology, cost, and warranty coverage. The cost of solar is dropping across the nation. See prices in your area and get free solar plus storage quotes on the EnergySage Marketplace. What is the ElectrIQ Power IQ System? The IQ System is a complete home energy solution that stores energy, automates cost-reduction, provides backup power and insight with access from anywhere in the world. It can be installed as part of a new solar panel system, or is easily integrated with an existing system. 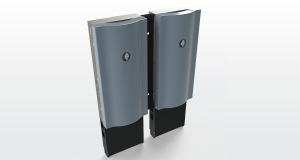 The IQ System battery offers 10 kilowatt-hours (kWh) of storage and is stackable, which means that multiple batteries can be installed at the same location to increase storage capacity. It’s priced similarly to other home batteries like the Sonnen eco and Mercedes Benz home battery. How does ElectrIQ Power's battery work? The IQ System is an ideal pairing for solar panel systems, especially if your utility has reduced or no net metering, time-of-use rates, or demand charges. Installing a solar storage solution like the IQ System allows you to maintain a sustained clean power supply during the day or night. As with other energy storage products, the IQ System is sized for day-to-day use at your home, and is usually installed alongside a home solar panel system. When your solar panels produce more electricity than you can use in your home, the excess is stored in the battery pack instead of being sent back into the electric grid. Later, when your panels aren’t producing enough electricity, you can use the electricity stored in your ElectrIQ home battery instead of having to buy it from your utility. Normally, this process happens over the course of a day: when the sun is high in the sky and your solar panels are producing more electricity than you can use, the surplus energy is stored in your ElectrIQ battery. As the sun goes down and your solar panel production decreases, you draw on the electricity that you stored during the sunniest part of the day. Essentially, the IQ System helps you balance out your electricity production and usage over the course of the day. How is the IQ System different from other home batteries? What this means for an average homeowner: it incorporates intelligent analytics that adjusts to your unique energy consumption, production patterns, and utility rate structures. The IQ System automatically updates itself with improved algorithms to better manage your household usage. It is also integrated with “smart home” devices, like smart thermostats, to better manage your household’s electricity use. Can you go "off the grid" with ElectrIQ and solar? Installing a solar-plus-storage system at your home is a great way to take control of your electricity bill, but it doesn’t mean that you’re completely disconnected from your utility. Going "off the grid" with solar and batteries is actually a more expensive and complicated proposition than you might think – and can present a lot of headaches in having to micromanage your energy usage. Most lithium ion home batteries only have enough capacity to store a few hours of electricity, and the IQ System isn’t really intended for fully off-grid applications. What is ElectrIQ Power's battery warranty, and how long does the battery last? A 10 kWh IQ System can help power your home for a few hours with a single charge. In most cases, homes with an ElectrIQ home battery will charge and drain the battery every day – unless all you want is purely backup power. The IQ System comes with a 10-year warranty that assumes your battery is used for daily charging and draining. If the battery malfunctions during that time, it is eligible for replacement under ElectrIQ’s battery warranty. ElectrIQ’s lithium ion battery technology is similar to other rechargeable batteries both large and small: as time goes on, the battery loses some of its ability to hold a charge. Think of how the battery life of a brand-new smartphone compares to one that is a few years old. As you continually charge and drain your phone’s battery, it starts to lose some of its ability to hold a charge. The life of your IQ System's battery will deteriorate in the same way. That isn’t an indicator of a product flaw – all batteries lose some of their ability to hold a charge over time, whether it’s an electric vehicle battery, a home energy battery, or a rechargeable AA battery. Unlike some home battery manufacturers, ElectrIQ doesn’t yet offer a warranty for battery capacity over time. (For example, LG states that its RESU battery will retain at least 60 percent of its storage capacity at the 10-year mark.) That being said, the software that comes with ElectrIQ’s battery works to ensure that the battery is operated so that it retains as much storage capacity as possible over time. In the future, the company may add a capacity or total energy throughput component to their warranty offering. How much does the ElectrIQ IQ System battery cost? The installed cost for an ElectrIQ Power home battery depends on the specifics of your home, as well as your location, taxes, and available incentives. Installed costs typically range from $15,000 to $18,000, which is in line with other home batteries. However, it is important to recognize that every home energy storage system is different. The best way to get a sense of your costs is to talk with a qualified installer. If you want to install the IQ System as part of a solar-plus-storage system, battery costs are just one part of the equation. An average 5 kilowatt (kW) solar energy system costs anywhere from $8,500 to $16,000 depending on where you live and the type of equipment you choose. That may sound like a lot of money, but installing a solar-plus-storage system can be a worthwhile investment. Solar battery economics depend on a few different factors. 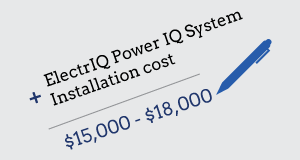 Whether or not the IQ System makes sense for you depends on the way that your electric utility structures its rates, the size of your solar system, how much you value backup power, and your reasons for installing a solar battery. Should you install an IQ System or other solar battery? Solar batteries are a fairly new technology for homeowners. While they offer significant benefits for some, they aren’t always a necessary investment. If your utility offers net metering, installing a solar battery won’t save you money. However, if you install a solar panel system in an area with time-of-use (TOU) electricity rates, no net metering, or significant demand charges, or if you are looking for sustainable backup power, a solar battery could be a good choice for you. ElectrIQ has a certified installer network, and the IQ System is available throughout the United States and Canada. Whether you want to install an IQ System or other home battery pack, you will need to work through a certified installer. Adding energy storage technology to your home is a complicated process that requires electrical expertise, certifications, and knowledge of the best practices required to install a solar-plus-storage system correctly. A qualified EnergySage-approved company can give you the best recommendation about the ElectrIQ home battery and other energy storage options available to homeowners today. If you are interested in receiving competing installation quotes for solar and energy storage options from local installers near you, simply join the EnergySage Solar Marketplace today and indicate what products you’re interested in your profile’s preferences section.